We are always open to new membership in the First Unitarian Adult Choir. We encourage singers to join us on Wednesday nights from 7-9 p.m. in the choir room. 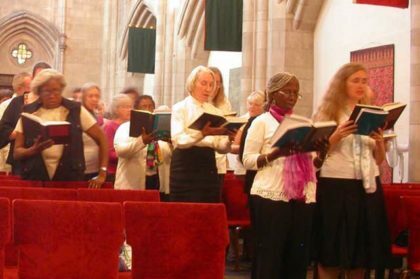 The adult choir is a community of individuals who love to sing, and whose spiritual life is enhanced by their work. They serve the congregation in many ways, and have a real commitment to our community to bring additional life and meaning to our services through shared music. Please contact Music Director Jeff Hamrick. if you have any interest in participating. The purpose of the Family Choir is to promote unity through music. We will perform unison music, and music with simple harmonies, which will allow voices of all abilities and ages to sing together. Every person is invited to sing in the Family Choir: Children do not have to have adults in order to sing, and adults don’t have to have children to sing. Please contact Music Director Jeff Hamrick if you would like to participate. There are many opportunities to perform for the congregation, solo or in an ensemble. Contact Music Director Jeff Hamrick. The Auction, held in the Spring, depends on people to donate events AND people to bid on those items. It is not too early to start thinking about what you could offer (and it doesn’t have to be expensive – just fun or interesting). You could give a tour of someplace you have access to that most folks can’t see – a national research facility, backstage at the opera, a really historic building or cemetery. Baby sitting is ALWAYS a hot item. You could organize a dinner party, a musical event, or a family picnic. We will have some no bid items which can be just signed up for (picnics, movie nights, what else can you imagine?). Perhaps you can you teach someone to do something better. For our Silent Auction, we need folks to ask their favorite restaurants, hair salons, book stores, or airline for gift certificates. Can you make up a special gift basket to auction off? We need you to donate and participate in the spring Auction. Contact Cheryl Wegner with questions and ideas. Teach in our Children’s RE Program.Contact the RE director, Beth Moss, for more information. The Emancipation Proclamation Pageant, which consists of three Acts, is a combination of narration, dramatizations, music and interaction between the cast and the audience. The theme is the role which multi-racial unity played in abolishing the slave-labor system in this country. The performance is in early January. For information on participating, contact Finley Campbell. The Worship and Music Committee is responsible for assisting the minister, music director and director of religious education in the planning and presentation of our Sunday worship services. In preparing the worship services the committee uses its knowledge of congregational tradition, history and preferences in giving feedback and suggestions to the Minister. In addition, the committee recruits worship associates, who actively participate in the service. You can also participate in the Sunday Service by volunteering as an usher, a bell-ringer, or a chalice-lighter. Contact the ministers, Teri and David Schwartz.